I'm loving the latest palette from Sleek, Rio Rio, which has the rightmost yellow (above) as part of the shade line-up. It's a really glowing almost-gold metallic yellow. Yum. 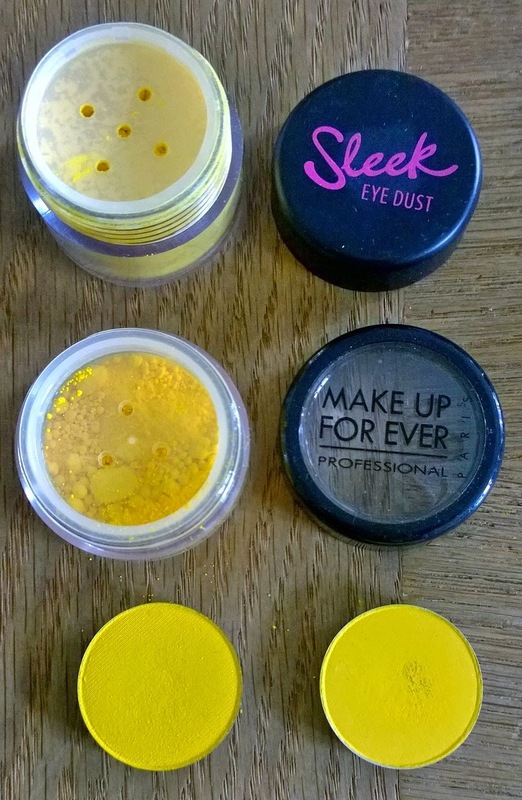 My favourite of the mattes above would have to be the MAC Chrome Yellow for convenience, although the Make Up For Ever Pure Pigment is handier in terms of what you can do with it (MUFE Pure Pigments are straight up monochrome, non-mixed/blended pigments with little or no filler). It's probably the most long-lasting of all of the above on the lids. Yellow works amazingly well on its own, packed onto the eye, with a cut crease in blues or charcoals. (black, I personally think, is a little stark/harsh against it, brown can look a bit "bumblebee"). I think that the Sleek dust one cost me €2 in a Sleek (online) sale (usually around the fiver mark), making it the cheapest of the lot. The MUFE one is probably the most expensive. Don't be scared, go experiment with yellow - it'll prolong the summer and brighten up your face!